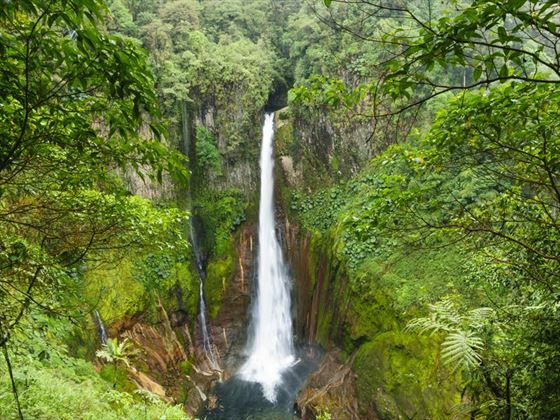 With lush tropical scenery and idyllic hideaways, Costa Rica presents a beautiful backdrop for a romantic honeymoon escape. Taking you on a whimsical 10-night journey, this tranquil tour will take you to three naturally beautiful areas. Begin with Bajos del Toro, a small town located on a volcanic mountain range, where you will enjoy a beautiful waterfall hike and stay in the secluded haven of El Silencio Lounge. Then, it’s on to La Fortuna, home to the jaw-dropping Arenal Volcano as well as the Tabacon Grand Spa Thermal Resort, your home for the night, and one of the Leading Hotels in the World. Lastly, you’ll journey to Santa Teresa, a gorgeous beachside town home to golden sands, amazing surf, and the remote Latitude 10 Hotel (HOR). Take part in a fun Costa Rican cooking class. Once you’ve arrived in Costa Rica, you will be privately transferred to Bajos del Toro, a small and idyllic town known for its rural beauty and its prime location in a volcanic mountain range. Driving past the city of Alajuela and the quaint town of Zarcero famous for its tree sculptures, the journey to this charming location is one of beauty – we’d recommend getting your camera ready. Once you’ve reached Bajos del Toro, you’ll be transferred to El Silencio Lodge – your home for the next three nights. This tranquil lodge is inspired by traditional Costa Rican countryside homes, opting for no TVs or WiFi so that you can escape everyday stresses and simply enjoy getting back to nature. The gorgeous suites here boast either mountain or river views, private outdoor whirlpools, floor-to-ceiling glass doors that open out onto a viewing deck, and even a gas fireplace for cosy evenings in. Meanwhile, the main building looks out onto a dramatic canyon, offering a spacious deck, a fire pit and a coffee lounge in which to enjoy the views. Today you will embark on a stunning guided waterfall hike tour. The lodge’s eco-concierge will take you on a scenic journey to the area’s breath-taking waterfalls, following a crystal-clear creek to find the cascading waterfalls and learn all about the cloud forest eco-system and perhaps even see some beautiful birds. The hike will take an hour and a half to two hours, and walking sticks will be provided. The day is free for you to spend it as you wish. The hotel offers a range of wonderful tours to choose from, or you could simply relax at the lodge – there’s a lovely Esencia Spa and a yoga deck to enjoy. Enjoy breakfast at El Silencio Lodge, before being privately transferred to the area of La Fortuna, otherwise known as Arenal. 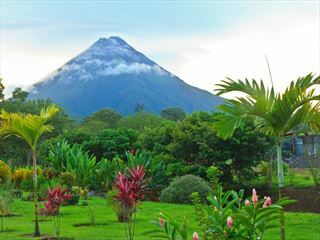 Nestled north of the Tilaran Mountains, this tiny yet picturesque town is a gateway to Arenal Volcano National Park, and offers a myriad of hot springs, lakes, natural reserves and culture tours to enjoy. Once there, you’ll arrive at your hotel for the next three nights – Tabacon Grand Spa Thermal Resort. 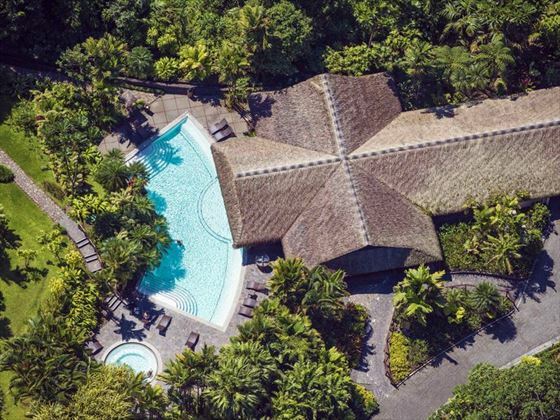 Tucked away at the base of the jaw-dropping Arenal Volcano, this is one of the Leading Hotels of the World, known for being a carbon-neutral resort offering luxurious amenities in an organic setting. You’ll be staying in a Rainforest Suite, located amongst the resort’s volcanic grounds and thermal springs. There’s plenty of mineral springs to explore too, or you could relax at the Grand Spa and enjoy a treatment in one of the open-air bungalows. 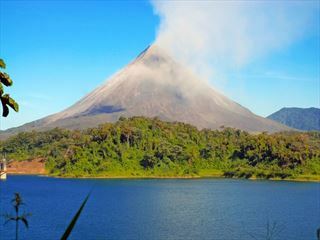 Today you will be taken on a scenic Arenal Volcano hike tour. Journeying along the base of the volcano, you’ll come across vibrant views of the luscious secondary forest. This is a gentle walk, mostly focusing on enjoying beautiful vistas and getting closer to this awe-inspiring volcano. Day six will be spent tantalising your taste buds with a brilliant cooking experience. Meet with Chef Scott Alan and his local chefs to discover all there is to know about delicious Costa Rican cuisine, spending the afternoon learning about the traditional cooking style, typical Costa Rican ingredients, and also how to create the perfect tropical cocktail. 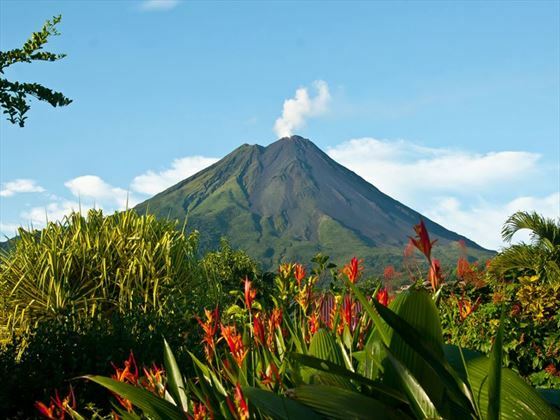 You’ll be treated to amazing views of Arenal Volcano as you prepare your very own exotic meal, with the afternoon taking place at the gorgeous La Casa Rústica located at the base of the volcano. After breakfast, you will be transferred to La Fortuna airstrip for your short flight to Tambor airstrip, where you will drive to Santa Teresa. 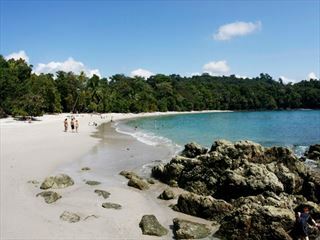 This is your chance to experience Costa Rica’s astonishing beaches. Santa Teresa is a gorgeous, small beach town, offering panoramic Pacific Ocean views and the classic beachside lifestyle – yoga, romantic strolls, surfing, and sumptuous seafood plucked straight from the sea. There’s a touch of Costa Rican tropical charm here too, including adrenaline-fuelled zip lining through lush canopies. 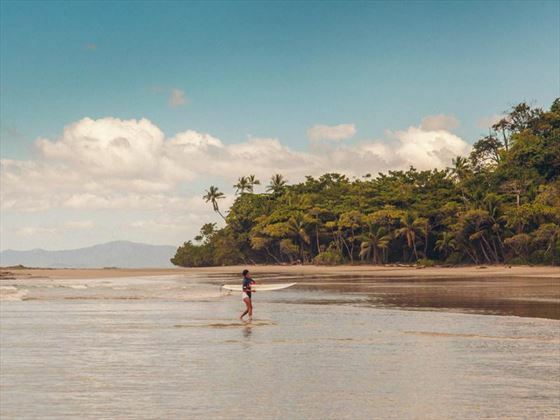 Your next four nights will be spent at Latitude 10 Resort, perched on the Nicoya Peninsula along the Northern Pacific Coast – an area renowned as one of the best surfing spots in Costa Rica. This is an elegant boutique hideaway, boasting secluded, open-air casitas hidden away amongst beautiful gardens and located just steps away from a remote beach. Today is free for you to enjoy this beautiful boutique. We’d recommend spending some time by the pool, and enjoy succulent seafood dishes at the welcoming restaurant. Another day of leisure. There’s plenty of exciting activities you could enjoy today, including fishing, horse riding, or even an exhilarating tropical canopy tour. Time to savour your last day in paradise. Enjoy a lazy day by the pool or in your fabulous Junior Suite, or wander along to Santa Teresa itself to explore the local restaurants, shops and activities. Today marks the end of your romantic honeymoon. You will be transferred to Tambor airstrip for your flight to Juan Santamaria Airport. From there, you will board your onward flight.